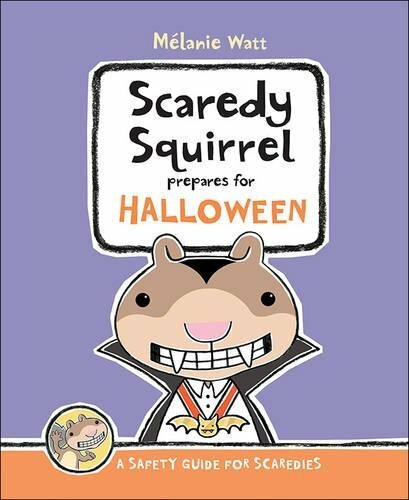 Scaredy Squirrel Prepares for Halloween is title #7 in Mélanie Watt's Scaredy Squirrel series. The Kids Can Press picture book shares a Canadian flying squirrel's October 31st fun. • rear flap with biographical extract modeling relevant experiences (downside of being spooked, getting bad candy, removing make-up versus upside of carving jack-o'-lanterns for friendly celebrations and creating costumes) and fears (haunted houses) preceding self-portrait at work amid wall art. Its preface and eight chapters constitute a picture-filled chapter book and safety guide for scaredies. quizzing readers Reacting In Panic to fruit bats, haunted houses, pumpkins, and spiderwebs. serving black cakes and orange carrots and popsicles. outsmarting Dracula, Frankenstein, mummies, and witches with brooms, countdowns, mirrors, and twirls. snack tables with devilish eggs, misfortune cookies, monster-mashed potatoes, and sandwitches. 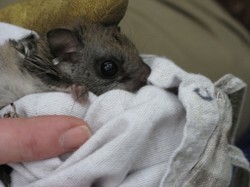 North America's northern and southern flying squirrels (Glaucomys sabrinus, G. volans) juxtapose spacious bio-geographies with security-oriented, socializing, stay-at-home, thermo-regulating life cycles and natural histories. They know no hibernation even though they venture more cautiously and infrequently away from communal tree-trunk cavities in fall and winter. They live in sylvan predator/prey niches where they prioritize eluding natural enemies and gathering for downtime, forages, mealtimes, and sleep. Mélanie Watt, author, Potato Cut-set text's acrylic and charcoal-penciled artwork designer and jacket illustrator. 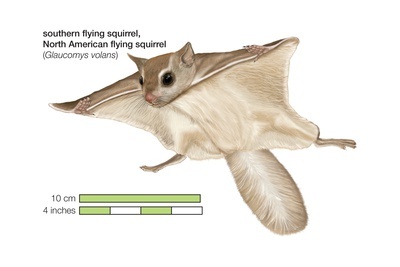 Southern Flying Squirrels (Glaucomys volans) test their flying abilities anywhere, any time. Southern Flying Squirrel in flight. Scaredy Squirrel's Scared of Skiing Skeletons! Watt, Mélanie. 2013. Scaredy Squirrel Prepares for Halloween. Scaredy Squirrel Series Title #7. Toronto, Ontario, Canada; and Tonawanda, NY, USA: Kids Can Press. A Southern flying squirrel (Glaucomys volans) in the branches of a Red Maple (Acer rubrum) tree. Scaredy Squirrel at the Beach is title #3 in Mélanie Watt's Scaredy Squirrel series. The Kids Can Press picture book reveals a Canadian flying squirrel's hunting perfect seashells.